Looking E from garden/farmyard wall across area to front of house, including unexcavated area over possible water tank. Looking N out of approx location of kitchen window over unexcavated area possibly containing underground water tank. 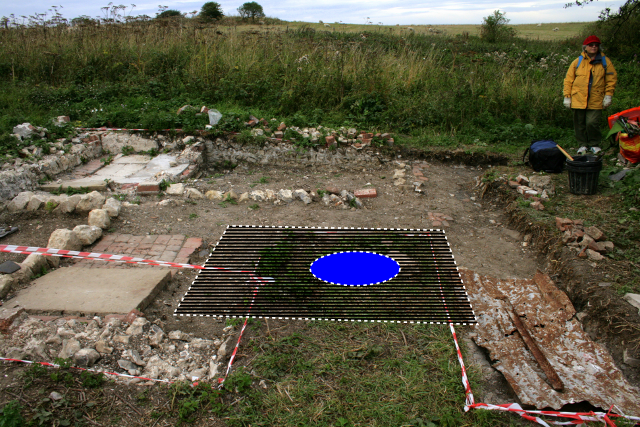 A relatively quiet day – archaeologically speaking. Cleaning up the grid squares surrounding the 1x1m area where we most expected the opening to a water tank may have been in front of the house. Looking N from out of site of kitchen window at possible site of a water tank in front of house (drain hidden under corrugated iron). This enabled us to better see the contours of the original ground surface and identify the possibilities of an approximately 6’x6′ square backfilled cut which was just inside the paths between the front door, the outside toilet, the front garden gate, and the woodstore on the east side of the house. Relatively few finds were uncovered – (a rim of a pretty pink glass container, perhaps a small vase or a bowl, was one of the nicest, and part of a WW2 hand-grenade was one the least nice) – which when compared with recent dig days was almost a relief – digging was quicker, and also meant less to record, to carry back, process, and store! 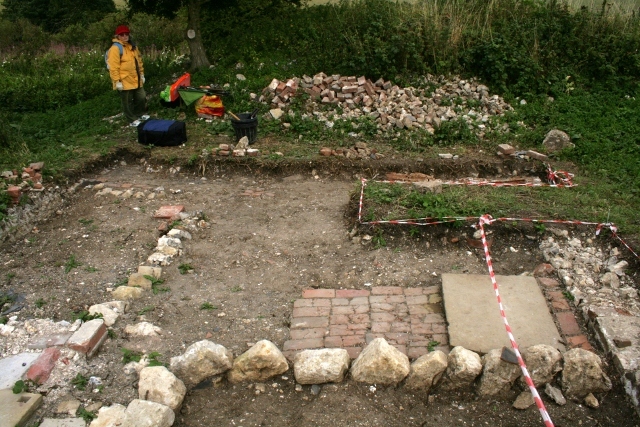 It is now September so the clock is ticking to get the rest of the house excavated, cleaned up, and recorded by – hopefully – mid-October. Then perhaps a guided tour of the site might be arranged for the end of October/beginning of November – before the trenches are back-filled by Christmas – to prevent the winter frosts from damaging the site. Friday’s weather is forecast to be wet, but we will be at the car park near the junction of Bexhill Road and Falmer Road, just north of Woodingdean, at 10am, and will make our decision whether to dig then. Even if it is too wet to dig we would be happy to give a quick guided tour for anyone interested.